What Makes Brain Monkeys different? Brain Monkeys is a unique organization which offers programs to all ages and learning styles. We believe in customizing our curriculum to reach each individual learners interests and learning style. Our instructors are patient and understand that each child is different. We believe that being able to reach each individual learner and creating an environment and curriculum that fosters their needs and interests is something that makes our company stand out from others. Parents often tell us that their child had a challenging experience at other camps or at other classes but when they came to our program, they seemed to blossom and become more confident. We see this a lot and pride ourselves on our ability to communicate with children and invite them to learn with us. Education is a life long journey and success is built upon perseverance through the failures and mistakes that are thrown at us. Our students are taught to question, explore, invent and to never give up! 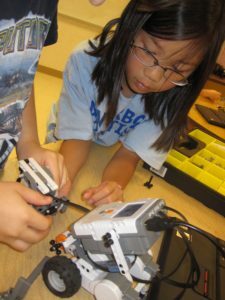 We facilitate and offer programs as part of after school Enrichment Programs, Summer Camps and Homeschool Groups. Our course curriculum is vast and if there is interest in a topic, Brain Monkeys has probably taught it or will work to develop it.